March 15, 2013 Greybull Standard Obituaries Comments Off on Dorothy A. “Dot” Kimbro. Dorothy A. Kimbro, formerly of Basin and Greybull, died Thursday, March 7, 2013, in Kingwood, Texas. She was born in Longmont, Colorado, March 7, 1929, the oldest daughter of Gus and Helen (Higgins) Abrams. 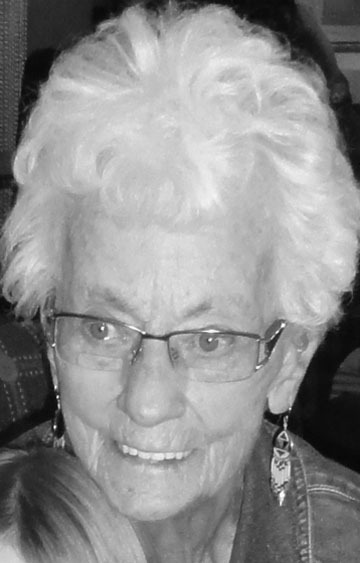 She was raised on the family farm between Loveland and Berthoud attending schools in Campion and Loveland, graduating from Loveland High School in 1946. She attended Colorado Women’s College in Denver, Colo., before transferring to Colorado A & M (now Colorado State University University) in Fort, Collins, Colo. There she met K. Russell Kimbro and they were married Jan. 23, 1949. They made their home in Shell, Wyo., living and working on the family farm until 1959, when they purchased Horn’s Home Furnishings in Greybull. After I was destroyed by fire in 1964, they purchased the Reilly Motel which they operated as the K-Bar Motel until her retirement in 1992. They moved to Basin in 1999 where she resided until Nov. 2012 when she moved to Kingwood, Texas, to be closer to her son, Dave. Dorothy was an accomplished musician, serving as organist and pianist for the First Presbyterian Church in Greybull and the Shell Community Church in Shell for many years. She also served her church as a Deacon and in many other roles as needed. She was an active member of Chapter F P.E.O., Big Horn Chapter of the National Society of D.A.R., past worthy matron of Lewisia Chapter of the Order of Eastern Star, Shell Garden Club and the Shell Coffee Club. A voracious reader she worked and volunteered for the Greybull Library. She enjoyed playing golf and worked and volunteered for Midway Golf Club. She loved games of all kinds, playing in a variety of bridge clubs, Yahtzee with her good friend Dawn, or any form of card game with almost anyone. She loved to travel and kept journals of the places she visited. She was an accomplished genealogist and put together several family books of her and of Russell’s family. She was preceded in death by her parents, husband Russell Kimbro in 2001, and infant twin daughters in 1949. She is survived by her sister, Marilyn Fishburn of Loveland, Colo.; son and daughter-in-law, Dave and Becky Kimbro of Kingwood, Texas; daughter and son-in-law, Pam and Rod Richardson of Laramie, Wyo. ; granddaughters, Andrea (Bret) Nielsen, Danielle (Justin) Mitchell and Alyson (Lee) Stevens; grandsons, Geof and Bryan Kimbro; three great-grandchildren; two nieces; one nephew, numerous cousins and many friends. Services will be held Thursday, March 14, 2013, at the First Presbyterian Church in Greybull at 10 a.m. A viewing will be held at the church a half hour prior to the services. Internment will follow at Whaley Cemetery. A potluck luncheon will follow at the First Presbyterian Church. Pallbearers are Geof Kimbro, Bret Nielsen, Justin Mitchell, Bruce Fishburn, Larry Meade and Jerry Ewen. Honorary pallbearers are Donald Olson, Robert Nielsen, Loren Good and Augie Garcia. Services are under the direction of Atwood Family Funeral Directors, Inc.
Memorial contributions can be made in Dorothy’s name to Big Horn Federal, Box 471, Greybull, WY 82426 to benefit the Greybull library.